Nowadays, with a DSLR or a mobile phone, everyone can be a photographer and save memories about life, work or travel in digital photography. However, no matter which kind of camera you use, losing photos is the biggest enemy for photographers. Photos can be lost due to deletion, formatting, corruption and various other accidents, but it is possible to get them back with photo recovery software. In addition to expensive shooting devices, photo recovery software is the best gift for photographer. What You Can Expect from a Photo Recovery Software? 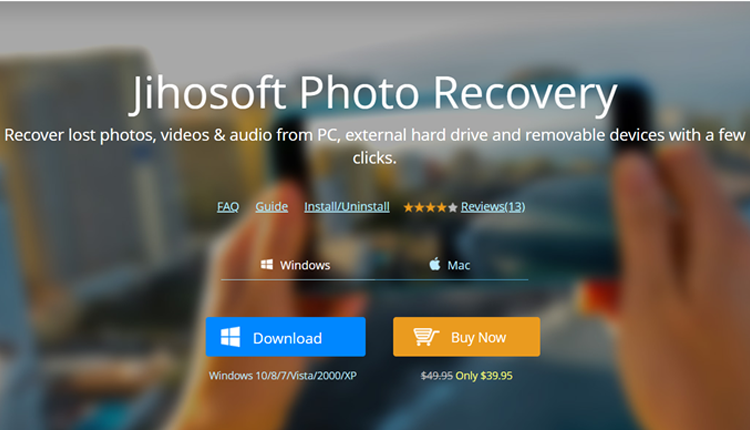 There are so many photo recovery software to choose online. How to choose the best tool for you? The following criteria may help you decide faster without in-depth knowledge. Easy to use. It would be another headache if we have to go through hassles to restore lost images. Support the image formats of your camera. RAW picture formats have a far long road to get unified. Even latest Windows 10 computer cannot preview all RAW images by default. Support the storage device of your photos. Not only the memory card of your camera, but also USB drive, computer hard disk and other storage devices that you may move images to. Make sure you can recover the pictures you need. Preview before recovery is of course a must. Money return guarantee will assure you to give it a try. Stop using the storage device after data losing. Deleted photos can no longer be restored if new files overwrite them. Perform photo recovery with professional recovery program as soon as possible. The chance of successful recovery will significantly increase if you use professional utility quick. Jihosoft Photo Recovery is a professional photo recovery software that can fulfill all your expectations. It can recover photos, videos and audio files deleted or formatted from SD memory card, USB flash stick, external hard drive, computer internal hard disk, etc. Download and install the best photo recovery software, and then follow steps below to retrieve your precious memories. Step 1. Run Jihosoft Photo Recovery, and choose Recover Photo. Step 2. Select the partition of your image storage device. Advance Scan offers file format options. Step 3. Click Scan Now, and wait it to complete. Step 4. Preview photos, videos and audio. Find the files you need conveniently with Filter and other considerate features. Step 5. Choose the images you need, and click Recover button to get them out. After recovery, you can open the restored folder to check the images. All recovered files are perfectly organized in separate subfolders. Want to recover more kinds of files, like Office document and compressed file? Check a File Recovery Software. Now you should know how to recover lost photos. In case you lose important photos by accident in the future, make sure you can find this tutorial to guide you through the process of photo recovery.